The transition from summer to fall brings changes. Some are welcome, while others are not. Leaves change, air temperatures drop, and daylight dwindles. Salmon swim frantically upstream to pass on their lineage. Waterfowl start swinging south and deer lock and rattle antlers. One frequently overlooked change in fall is the lower water temperatures of small streams. Trout fishing in Central New York (CNY) is great in the spring and early summer while water temperatures hang below 65 degrees through June. 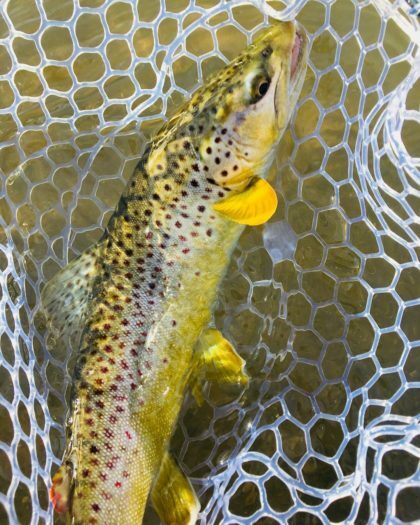 As July, August, and September can bring blazing heat, stream selection is limited to a small handful containing cool water year-round, or we abandon trout completely in pursuit of other finned creatures. By the end of September, water temperatures drop to healthy levels and streams get a bump in flow from fall rains, triggering a fishery that is, for the most part, very overlooked. That fishery is streamer fishing for big, aggressive, mean trout. If you’ve read my previous article on nymphing, hopefully you remember the part I mentioned my stubbornness to fish streamers certain days with no intention of altering tactics, regardless of how few fish I’ve hooked. I really enjoy streamer fishing, but I know it does not appeal to everyone. It’s a challenge. If you’re a guy, or gal, who wants to catch a bunch of fish and have a jolly good time doing it, you, more times than not, won’t find that fishing streamers locally. You’re handicapping yourself severely in the fish catching department as it requires a special kind of trout to hunt down a big feathered fly that resembles a drenched baby bird and demolish it with savage aggression. If you’re a dude, or a lady, who is into working hard, covering lots of water, making precise casts with a honkin’ fly to trigger an aggressive strike from the biggest and baddest trout in the hole, with the possibility of that trout refusing the fly and flipping you the bird at the very last second, ending your day aggravated, fishless, and in defeat, then… maybe streamer fishing is for you. If you’re into seeing bruiser Brown Trout splash and leave a wake behind them and charge a fly like a marlin on the hunt for a trolled bait, streamer fishing is for you. If you’re into takes that rip line out of your hand and fish that test your skills as an angler, streamer fishing is for you too. Leave the 3 and 4 weight rods home. Leave the 15 spools of tippet home. Short, stout, fluorocarbon leaders are all that’s needed. A 5-7 weight rod, a sink tip line or a poly leader to go on your floating line, and a half dozen different colored big and ugly flies will work just fine. If you’re like me, bring a few extra flies. Streams contain a lot of overhanging trees and large boulders, and one or the other, or both, is sure to get the best of me. And a landing net, don’t forget that. Pick a stream and look for water the largest trout are likely to occupy. In higher flows, this is easier to do. A bump in flow and some color to the water, so long that it doesn’t look like the Amazon in monsoon season, gets trout excited as they feverishly move into feeding lanes and leave the areas they’ve been holed up all summer. As the spawn season later in the fall draws closer, the more trout move and the more aggressive they become as well. I like targeting trout in the days following a rain event. Higher flows move fish around, wash more food through the system, and add turbidity, helping mask my approach. Skip water that doesn’t look conducive to holding big fish. That’s not to say we won’t catch small fish because they get fired up too, but we’re hunting the meat eaters. Stalking areas with the highest chance of finding big fish and presenting a #2 feathered thing in precise fashion is the name of the game. These are not rivers with vast open areas where we blind cast emphatically to cover the most water possible. They are tree and brush lined and can be crossed with a hop and a skip, no need for a jump. Approach the streams stealthily. Big trout are extremely aware of their surroundings. If small fish spook and dart through a hole past the big fish, they know something is up and you’re busted. Big fish don’t get big by being stupid. Cast to the biggest fish. Fishing the bottom of the hole first and catching a small fish or two before moving up only blows your shot at the granddaddy. More times than not, fish will take the fly in the first few casts. If you’ve put ten casts to a specific area, move. Those fish are probably spooked and are no longer part of the equation. Move stealthily to the next haunt of big fish. Try different retrieves. Work the fly back short and quick, or long and slow, or make it dance by just twitching it. Make it look like it’s being chased. Be sure to work the fly back as far as possible. Use all the stream and real estate available. Many times, big trout will stalk the fly the entire width of the stream, and eat it at the very last second. I like flashy and shiny flies and I generally go with dark colors in dirty water, but light-colored flies with clear water. If a fish flashes at the fly, but refuses, try a different color or style. Often, I’ll let that fish settle back in for 20-30 minutes and come back with a different color and approach. Keep the rod tip low on the retrieve. This decreases the amount of slack in the line, allowing quick strike detection. 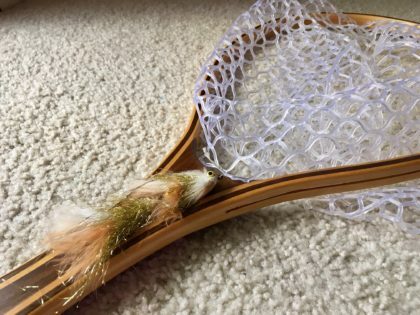 A strip set is key when streamer fishing. The last thing you want to do to a fish you’ve worked all day for is rip the fly out of its mouth. The standard “trout set”, jerking the rod tip toward the sky, is an absolutely fantastic and sure-fire way to make certain you walk the bank home shaking your head, without bringing a trout to the net. If you’re simply flipping the fly to the other side of the stream and twitching it back without any strips, keep the rod tip low and set softly in similar fashion to a strip of the line. The fish aggressively eating the fly and turning quickly does most of the work for you. Have a plan for landing a fish. Getting a fish to eat is only part of the battle. When looking at a hole, imagine a Brown Trout only heard of in folklore eats the fly. Now what? Directly across the stream is the logjam the fish was fooled from. Upstream, lies a small cascade with large boulders that a fish could easily wrap around. Downstream is a long stretch of whitewater. If the fish decides to run down there, best of luck. Knowing the surroundings and devising a plan for what to do when a fish is hooked is a key element in netting fish. Keep in mind you’re using heavier tackle. My uncle uses a saying all the time, “prior planning prevents piss poor performance”. While I know he probably never intended for that to come in handy fly fishing, it’s a line that can be applied to most facets of life and works well here. Now that I’ve devoted an entire paragraph to planning out the landing of a legendary trout, the netting of such a colossal fish seemingly never goes according to plan. Be prepared for the fish to wrap you around everything in the stream, get into the current and make a mad dash downstream, leaving your drag singing, you in tow chasing, hopping, tripping, and falling, generally resembling a baby giraffe on ice skates. This display of elegant coordination is sure to grab the attention of a buddy you’re with, and if he is lucky enough to have a camera with him, a candid photograph of your audition for the ballet is sure to be taken and posted online for the world to admire. Streamer fishing is challenging but it can provide an opportunity to tangle with a true monster. Don’t beat yourself up if you walk home fishless. It happens, and it happens more than I’d like to admit. An opportunity to catch a trout 20”+ on small streams exists, but it requires patience, frustration, hard work, and some plain old good luck. Lastly, have fun. Don’t forget to look up between casts. Fall is a great time to enjoy the streams. Leaves are changing colors. Critters are no longer seeking relief from blazing hot temperatures and are found scurrying along the stream banks. Many anglers have turned their attention to hunting, salmon and steelhead fishing, and football, leaving the beauty and sights of the banks of streams for you to enjoy in solitude with your finned companions. That is until a 20” gold missile shoots out from under a log jam, devours your fly, and the water explodes. Enjoy the ensuing chaos. Previous Post: Modern Nymphing and Competitive Fly Fishing… OH MY! Next Post: The Gear Guru? Not-So-Much.